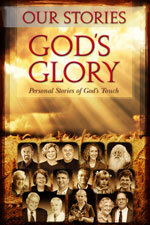 Our Stories God's Glory Everyone has a story—a story with the power to impact us in a special way. When an individual in this book shares what happened in his or her life, one central character emerges: GOD—the God of the Universe! Actually, all the stories in this book are God’s stories. God is the Giver, the Redeemer, the Encourager, the Forgiver, the Helper, the Rescuer, the Provider, the Savior and the Friend. We want to encourage you to write down your own stories of God's touch in your life. Share the challenges you have faced. Let us know how God helped you during a difficult challenge you faced. Let your heart, mind, and spirit become more sensitive as to how God is at work in and around you right now, even when it may not seem like anything is happening. As you remember people throughout the Old and New Testament who experienced God's promises and blessings, let their stories encourage you that nothing is impossible with God. What God has done before, He can do again. Most of the stories in this book, OUR STORIES, GOD'S GLORY, come from people David & I have known here in the Portland area for over thirty years. We know the integrity of each individual and we are convinced of the truth of their stories (copywritten by Seed Faith Books). As people have shared with us their experiences of God at work in their lives, we have discovered each story to be unique because our God, Creator of the Universe, never seems to do the exact same thing twice. Would you like to share your story on this blog or for the next book? Just click on: Submit your Story.